A Nebraska panel on Monday approved an alternative route for the Keystone XL pipeline, removing the last regulatory hurdle for the $8-billion pipeline project. Just last week, 5,000 barrels — or 210,000 gallons — of crude oil spewed out of the ruptured Keystone pipeline, a sister project, onto the earth in rural South Dakota. It was the worst breach yet of this particular line, confirming the fears of those who oppose large crude oil and natural gas lines. Pipelines are often touted as safer than train or truck for transporting oil and other hazardous materials. 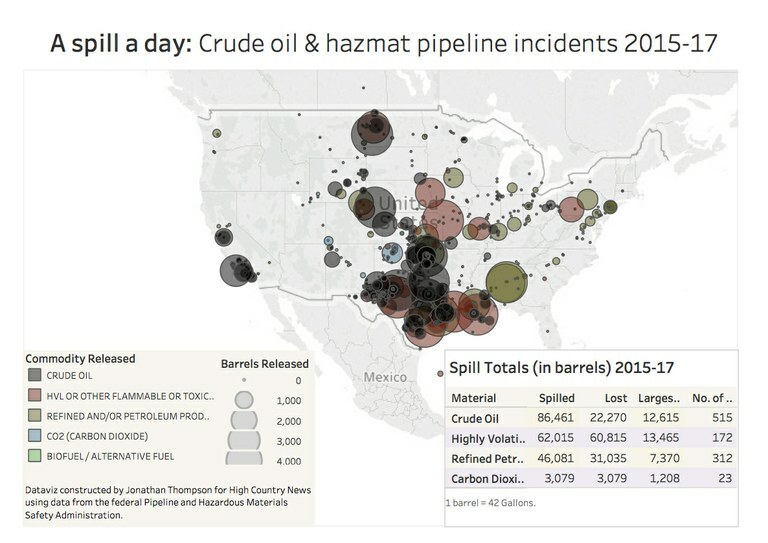 But over the last two-and-a-half years, crude oil and hazardous materials pipelines across the U.S. busted at a rate of more than once per day, through corrosion, floods, lightning, vehicles and vandals. That doesn’t even take into account incidents on natural gas lines. Some 3.6 million gallons of crude oil spilled in total, and five oil spills were as large or larger than the Keystone incident. Less than a year ago, more than 300,000 gallons of crude spewed from a pipeline into a creek North Dakota. Various incidents killed or injured people, forced evacuations, contaminated waterways and smothered fish and birds. Click image to view an interactive version of this data. Dataviz by Jonathan Thompson for High Country News using data from the federal Pipeline and Hazardous Materials Safety Administration.